Anusara Yoga focuses on postural alignment in the body and positive alignment in the mind. 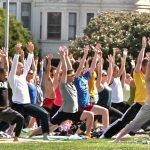 Together, they create a style of yoga focused on a connection with spirituality from the inside-out and a belief that people are inherently good. 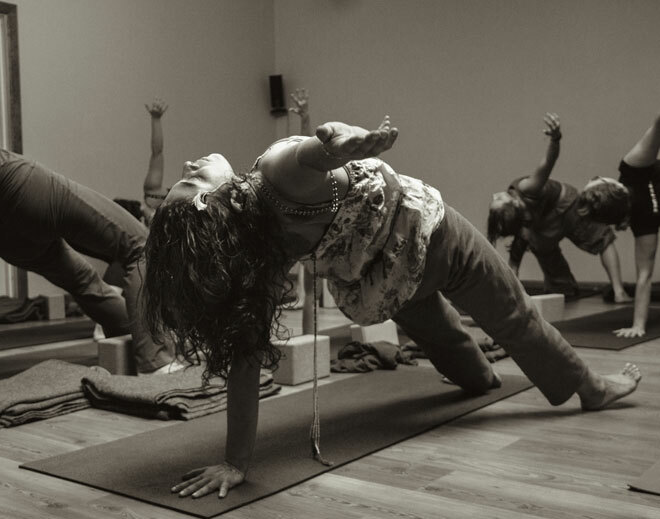 Founded in the mid-90’s by John Friend, Anusara quickly became one of the most popular styles of yoga in the West. This is thanks in part to its focus on fostering community, inclusiveness and a belief that everyone can connect with the divine. Friend’s journey with yoga began at the age of 8 when he became captivated by stories about yogis who had developed supernatural powers. That curiosity about the esoteric potential of yoga was bridged with the physical asana when he started a regular practice of Ashtanga yoga and later Iyengar. Though he was passionate about yoga, he was became frustrated by what he saw as isolation between mind and body he found in these two styles. He eventually developed his own brand of yoga based on Tantric philosophy and dynamic biomechanics, which became Anusara, meaning “to step into the current of divine will”. Anusara is a physically vigorous practice. Classes comprise of chanting, invocation and asana grounded in themes supporting Anusara doctrines, which are: the Universal Principles of Alignment; Energy Loops; and the Three A’s—Attitude, Alignment and Action. Anusara teachers design classes to support a peak pose. Sequences are constructed to round out the practice, keep the body safe and injury-free and support practitioners to stay open and free in their bodies even outside of the yoga room. Classes typically begin with the Anusara invocation to ground the class in tantric theory before moving into asana. 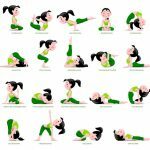 Following the invocation is a warm-up series of poses. Warm-up prepares the body for the depth needed to achieve a peak pose, for example Vasisthasana. The cool-down section of class is a thoughtful series of poses to ground the practice overall and integrate the asana at the cellular level of the body. Following savasana is a closing thought or meditation for students to take the joy found in their practice off the mat and into the world. The practice is famous for its rigorous requirements to achieve Anusara teaching designation. This means that you can be sure of a high quality of teaching if an Anusara teacher is at the front of the room. Classes bring heart-opening elements into almost all poses, which is believed to bring people more in-line with the divine principles upon which the style was founded. Even in poses not thought to be heart-opening, such as Uttanasana, students are encouraged to lead by melting the heart rather than hinging at the hips, as would be taught in other styles. In early 2012, rumors began flying about the inappropriate relationships Friend was having with his students, among other unethical behavior. These rumors were soon verified which had a cascading effect across the entirety of Anusara yoga, including the resignation of many senior teachers and demands that Friend step down as leader. He eventually submitted to the request by resigning as CEO of Anusara Inc. Since the scandal, the group was restructured and renamed Anusara School of Hatha Yoga with goals to become a non-profit corporation. Friend is no longer associated with Anusara yoga. There are currently many teachers spanning the globe within the Anusara School of Hatha Yoga. Teachers continue to be certified and trained in the original style and with the original Anusara princples.